Welcome to MikeandTheMouse: Downtown Disney - a closer look. Downtown Disney - a closer look. The Downtown Disney area is an exciting metropolis of restaurants, theaters and merchandise shops incorporating the Marketplace, Pleasure Island and the West Side. The 120-acre area borders the south shore of Village Lake at the intersection of Buena Vista Drive and Hotel Plaza Boulevard in the east-central portion of Walt Disney World Resort. Downtown Disney parking is free. 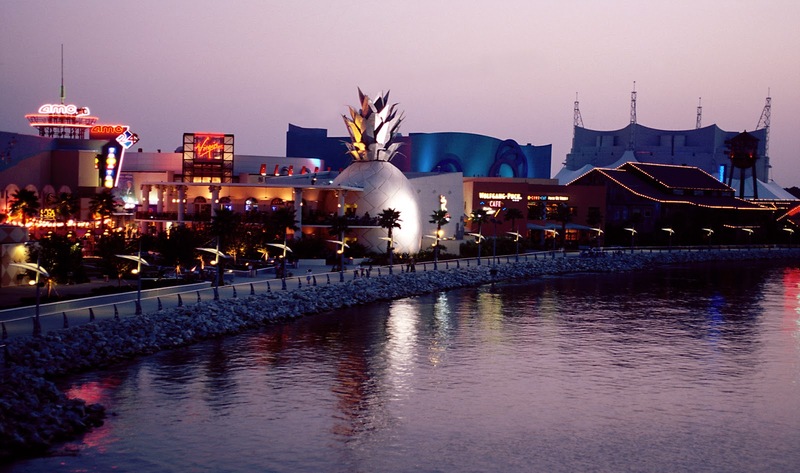 The 66-acre West Side, the largest of the three Downtown Disney areas, includes 344,000 square feet of buildings and a 9,500-square-foot area for events and entertainment. AMC Downtown Disney 24 Theatres – 24 separate auditoriums with stadium seating in 18 theaters for unobstructed viewing. Total area: 110,000 square feet. Includes six Fork & Screen dine-in theatres featuring menu items from quesadillas to flatbread pizzas. Reserved seating and table-top dining available. BLINK by Wet Seal - A young women’s contemporary apparel shop featuring the latest trends in denim and fashion tops. Bongos Cuban Cafe — Restaurant created by Emilio and Gloria Estefan brings the sizzle of Miami’s South Beach with Cuban cuisine and Latin rhythms. Seats 500, total area: 16,000 square feet. Characters in Flight operated by Aerophile — An iconic tethered balloon lifts guests some 400 feet into the sky offering breathtaking views of Walt Disney World Resort and beyond. Cirque du Soleil — The theatrical show La Nouba is filled with action, humor, color and light, blending the ancient traditions of circus with dance, acrobatics and street entertainment. Seats 1,671, total area: 73,800 square feet. The Cirque du Soleil Boutique is located in the Lobby-Plaza level. 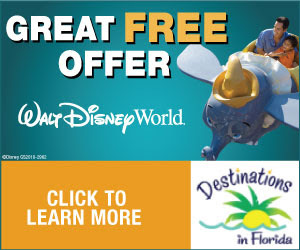 D Street – Apparel and accessory shop with largest selection of Vinylmation figurines. DisneyQuest — The ultimate interactive adventure. A 100,000-square-foot indoor, interactive theme park with five floors fueled by electronic Disney innovation including virtual reality, 3D encounters and classic video games. Includes The Wonderland Café for desserts and drinks, and FoodQuest for quick-service dining. The DisneyQuest Emporium is a themed shopping experience. Disney’s Candy Cauldron – Sweet treats like candy apples and fudge whipped up in an open candy kitchen. House of Blues — Live music every night including blues, jazz, country and rock with Mississippi delta cuisine. World famous Gospel Brunch. Restaurant seats 400, music venue holds 2,000, total area: 33,000 square feet. Hoypoloi — A gallery filled with an eclectic collection of uncommon art. Orlando Harley-Davidson Store - The largest (3,635 square feet) and most interactive Harley-Davidson store of its kind featuring apparel from T-shirts to leather jackets, plus an array of gifts and collectibles. A production studio lets guests transform into pro bikers perched on a gleaming Harley and appearing to ride in their favorite location. Guests can design their own biker vests. Planet Hollywood — Colorful three-floor-up-to-the-ceiling eatarena with famous movie memorabilia, video screens, music and a menu featuring sandwiches, pizza and steaks, and a store featuring themed merchandise. Restaurant seats 550. PoP Gallery — Original, artist-signed sculptures and paintings, as well as upscale gift items. Something Silver – Stylish, high-quality silver designer jewelry. Sosa Family Cigars — Premium cigar store features the art of hand-rolling cigars. Sunglass Icon by Sunglass Hut — Extraordinary collection of designer sunglasses and eyewear. Wetzel’s Pretzels — Features hand-rolled soft pretzels in a variety of flavors, fresh-baked pretzel dogs, Haagen-Dazs ice cream, fresh-squeezed lemonade and outdoor patio seating. Wolfgang Puck Cafe — Boldly colored, full-service eatery featuring wood-fired pizzas and an array of classic Puck entrees. Also includes The Dining Room at Wolfgang Puck Café, an elegant upstairs dining experience, as well as the quick-service Wolfgang Puck Express. Apricot Lane Boutique – Specialty store with celebrity-inspired branded apparel and fashion accessories including jewelry and handbags. Curl by Sammy Duvall — The place for high-end surfing gear, clothing and accessories that include eyewear, watches, footwear, electronics and surfboards. Fuego by Sosa Cigars — An upscale cigar bar/lounge where hand-rolled premium cigars are featured and wine, beer, spirits, plus specialty coffees and other non-alcoholic beverages are served. Fuego by Sosa Cigars is open to guests of all ages; anyone under age 18 must be accompanied by an adult of 21 or older. Fulton’s Crab House — A three-deck, 700-seat dining emporium aboard an iconic Mississippi-inspired paddle wheeler. Featuring fresh seasonal seafood favorites flown in daily from seaports around the world. Paradiso 37 — A restaurant and bar with casual atmosphere and open-air seating by the waterfront featuring a Tequila bar, wines and draft beer. Menu items are inspired dishes from the 37 countries of North, South and Central America. Entertainment nightly. Portobello - A rustic Italian trattoria ambience with authentic Italian fare. Wood-burning-oven pizzas, pastas and grilled fish are favorites. Seats 350 and includes outdoor dining on the waterfront. Raglan Road Irish Pub & Restaurant — A 600-seat restaurant featuring a true slice of Ireland and the very best authentic Irish food, drink, heritage and live entertainment. Includes outdoor patio dining, plus the Cookes of Dublin quick-service restaurant next door. Exciting restaurants and extraordinary shopping experiences in a strolling street environment with more than 20 venues. A variety of outdoor artisans with merchandise from cloth-covered balloons to creative hair wraps, and silhouette portraits to personalized wood nameplates can be found throughout the Marketplace. Arribas Brothers — Glassware, crystal and metal artisan products; glassblowing; custom decorating. Basin — All-natural bath and skin care products with interactive sugar- and salt-scrub sink for sampling. Cap’n Jack’s Restaurant – Fresh oysters or clam chowder with accompanying refreshments, sandwiches and other fare served around the Captain’s copper bar. Disney’s Days of Christmas — Christmas collectibles, ornaments and Disney character holiday items. Disney’s Design-a-Tee presented by Hanes — Customized T-shirts in a variety of colors, styles and themes. Disney’s Pin Traders — The premier location for pin trading at Walt Disney World Resort. Disney’s Wonderful World of Memories — Disney scrapbook supplies, stationery and postcards. Earl of Sandwich – A 220-seat casual quick-service restaurant serving breakfast as well as freshly prepared sandwiches, salads and delicious desserts. Ghirardelli Soda Fountain & Chocolate Shop — San Francisco’s famous sweet-maker comes East with a soda fountain featuring its world-famous chocolate and hot fudge sundae. Goofy’s Candy Co. – An assortment of candy, cookies, taffy, chocolates, frozen drinks and more. LEGO Imagination Center — A dynamic showplace and retail store for famous LEGO bricks and toys with an interactive playground and towering LEGO displays indoors and out. littlemissmatched — A colorful and playful retail store filled with fashionable accessories, beach bags, flip flops and mismatched socks for the teen, tween and mom. Marketplace Fun Finds - Disney character merchandise including plush, clothing and housewares at prices to fit every budget. Mickey’s Pantry — The family chef can explore culinary trends and find kitchen gadgets galore, from unique cooking utensils to mugs, as well as teas and coffees from the Spice & Tea Exchange. Once Upon A Toy — This 16,000-square-foot toy store features fun new toys, games and Disney collectibles. Pollo Campero - Latin tastes including signature chicken dishes and thick yucca fries are restaurant favorites. Features Bodie's All-American burgers, salads and wraps. Desserts, including gluten-free and vegan items, are from Erin McKenna’s BabyCakes NYC. Rainforest Cafe — A wild place to shop and eat with favorite sandwiches, pastas, pizzas and an amazing array of appetizers in a rainforest setting. Fantastic gifts, too. Seats 500. Team Mickey’s Athletic Club — Character apparel with Mickey and friends to suit any fan of any sport, as well as a selection of golf, NASCAR and authentic ESPN sporting goods. Baseball players can get customized baseball gear featuring lathed bats and engraved gloves, bats and baseballs at Rawlings Making the Game sporting goods shop. Also includes RIDEMAKERZ, an interactive venue to trick out remote control vehicles with some 649 combinations to create a mean machine. The Art of Disney — Disney animation art and collectibles from original paintings and prints to figurines and Vinylmation. Tren-D — Hip apparel and novel accessories for women with a fashion sense. T-Rex Café – Casual dining in a prehistoric world of adventure with life-size animatronic dinosaurs and prehistoric artifacts. Children of all ages can enjoy the dig site or the Dino-Store with educational toys and Build-A-Dino by Build-A-Bear Workshop. Wolfgang Puck Express — World-famous chef Wolfgang Puck turns his talents to quick service and signature treats including pizzas, sandwiches, soup and fresh salads. World of Disney Store — Centerpiece of Downtown Disney, this 51,000-square-foot retail palace is the biggest Disney shopping destination on Earth. Specialties include Disney-themed merchandise rooms, each telling stories based on classic Disney films, and Bibbidi Bobbidi Boutique, a magical salon for little princesses and rock star wannabes ages 3 and up.